There are many ranches, western apparel shops, honky tonks and other places all across the Mid West of the United Sates where one can learn to be and dress like a cowboy. In the US you can buy all the western ware you can carry, ride horses, watch rodeo and more... Your dreams are the limit. And yet, Japanese tour pamphlets only feature locations such as New York, Los Angeles and other metropolitan areas, and are very poor on featuring locations of western culture. As such, we have taken it upon our selves to feature travel information here for those folks who wish to immerse themselves in the cowboy and western lifestyle! If you have any such information from your own travels and are willing to share, it would be greatly appreciated. Competition is very heavy in the US, and as such, establishments are founded and closed quite rapidly. It is advised that interested parties call or otherwise contact the establishment of interest before visiting it. The information featured here is merely as an example, and REAL WESTERN guarantees nothing concerning it. Please be aware that we will assume no responsibility for any inconveniences you may encounter from visiting any of the establishments featured on this site. OUR ADVISE IS VISIT THE COUNTRY (RURAL) AREASYou can a true sense of the nation when you visit it's country sides. If you are aiming to become a cowboy, it is a must to visit the rural US. When talking about cowboys, one must look heavily at the areas along the Rocky Mountains like Wyoming and Montana, also known as "Cowboy Country." Also strongly advised is the Dallas / Fort Worth area of Texas, which is the central location for western fashion, horses and other western culture. Northern California is also home to a good number of ranches as well. Please utilize the below information for reference. Check out this page for information on the best show on dirt! A report of travels through the cities of Cody and Jackson as well as Yellowstone National Park in the state of Wyoming. Also included are ranches in and around that area. The official homepage of the United States' DRA. You can search for ranches in the western part of the US here. We will introduce advisable cities to visit here. If you have any locations, shops or experiences you would like to share, please feel free to let us know. Featured cities: Calgary, Stockyards, Nashville, Cheyenne, Jackson Hole, Cody, Tucson, Tombstone, Dodge City, New York, Las Vegas, San Francisco, Los Angeles, Chihuahua. The Stockyards, Ft Worth, TexasBest for the novice (?) Westerner! The Stockyards itself is not too large and you can walk the entire area it a relatively short time. You can buy all the hat and boots you ever wanted, see some rodeo action, hear some good Country Music and dance a bit too. There is so much to do, you only problem is deciding where to go. A definite must for the novice westerner. There are western ware shops and concert halls concentrated within walking distance, and you can go to the Cowtown Coliseum and see a rodeo once a week during the summertime as well. The "World's Biggest Honky Tonk" Billy Bob's Texas is also located here, and you can enjoy a big name concert every once and a while as well. Billy Bob's is host to it's own indoor arena, and conducts a bullriding once a week. Stockyards is located just outside of Ft. Worth, and is just a short drive from the Dallas/Ft. Worth port. It is advised you lodge right there at the Stockyards Hotel. It's in the center of town and the western interior is very nice. You will need to make reservations due to the limited number of rooms. Nashville, TennesseeA Trip Every True Country Music Fan Should Make At Least Once. The Mecca of Country Music, it contains many recording studios. It is also home to numerous country concert halls, and is a definite must visit for any Country Music lover. If you like to dance, you shouldn't miss the Wild Horse Saloon either. There are also many western apparel shops along Broadway in the downtown area, but prices are a bit on the expensive side. Every last week in July, Cheyenne plays host to one of the largest rodeo festivals in the United States, Cheyenne Frontier Days (CFD). CFD is a festival reminiscent of the days of Western Expansion, with a world class rodeo at it's center. The rodeo is complemented by parades of cowboys, Native Americans, and folks dressed in regalia of Cheyenne's founding days, as well as displays of daily life items of the day and other great festivities. At night, many big name Country Music acts of today conduct concerts there as well. It's just one big party of rodeo in the day and concerts at night! This is one of the oldest rodeos in America, and is known as "The Daddy of Them All" accordingly. It is a PRCA sanctioned show, and you get to see some of the best rodeo cowboys compete at this show. Be sure to check their website for upcoming dates of the event. Tickets for shows like the CFD and NFR are extreamly hard to come by sometimes, so you may need to make reservations as far as a year out. Also of note is that, the National Pro-Rodeo Hall of Fame is located in Colorado Springs, Colorado, only about a two hour drive from Cheyenne as well. If you're a rodeo fan, you don't want to miss this! This town is located near the Southern entrance to Grand Titton National Park, which is a neighbor of the famous Yellowstone National Park. You can found a number of live-act bars here, and during the summer they play host to a small rodeo twice a week (WED and SAT). The area is a popular skiing retreat during the winter as well. 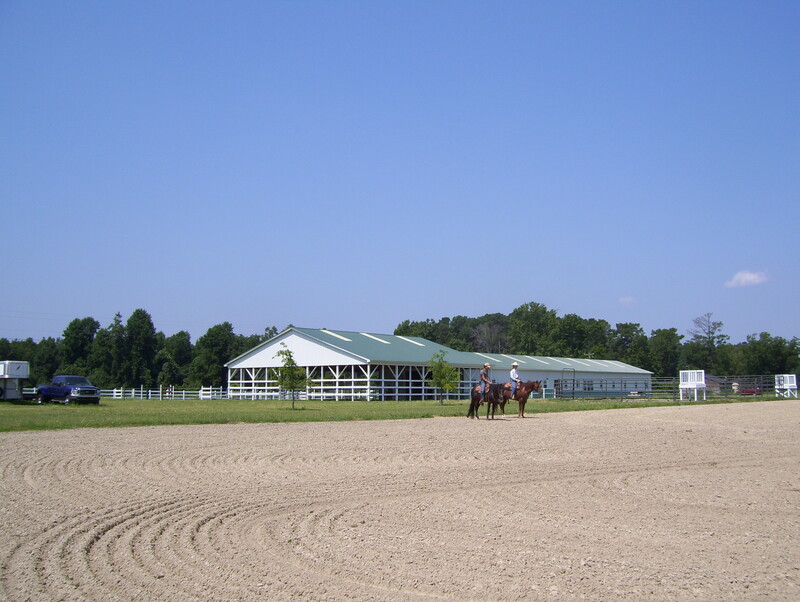 You can find any number of establishments to ride horses in the nearby areas too. The downtown area is great to visit for anyone, regardless if you are into the western lifestyle or not. It's a great place to take the family also. If you are intent on lodging near Yellowstone National Park, this is the place you should do it. (If you are intent on staying within the park during the summer months, you will need to make reservations at least four months ahead. But if you don't mind staying outside of the park, it's easy to find a room at the last minute.) Just as a note, West Yellowstone, a town located just out of the Western entrance to the park doesn't have many interesting shops, and is not advisable to visit. Other than a number of western apparel shops in downtown Jackson, there is also the Corral West Ranchwear. Just go west on the town's main road a bit, and it's on the south of a town you come to. The Corral West here is a significant size, and you should be able to find anything you could want here. Two hours east of Yellowstone, you come to the town which takes it's name from the famous Buffalo Bill Cody. It's small, but has a great museum, rodeo grounds and a number of western apparel shops. You can find the apparel shops along the main drive which runs through town east to west. The main drive curves south at the Holliday Inn on the eastern edge of town, and if you follow that down towards the airport for about 20 minute, it will take you to another Corral West Ranchwear. The Buffalo Bill Historical Center on the western edge of town is well worth the visit, and you should set an entire day aside to walk through if you plan to visit it. It is very large, and is composed of the Buffalo Bill Museum, which has on display many items from the days of western expansion as well as the life and times of Buffalo Bill, the Plains Indian Museum, which is filled with artifacts related to the Native Americans of the era, and the Fire Arms Museum which has many beautiful displays of an astonishing 3,000 classic fire arms. There is also the Gallery which has on display many western portraits, paintings and sculptures. Cody plays host to the Cody Nite Rodeo for four days every July around Independence Day. The town hosts to smaller rodeos every night from June to around October at the rodeo grounds also. The rodeo grounds are further west than the Buffalo Bill Historical Center (towards Yellowstone National Park) but is a bit too far to walk, so you should either drive or take the bus from your hotel. If you happen to be in Cody during the summer, don't miss the gun fights they stage in the late afternoon. Tucson, Arizona A Must for Fans of the Old Westerns! If you want an experience that will lead you to believe you are in one of the old westerns, then "Old Tucson Studios" may be the place for you. It's a theme-park designed like the movie set for an old western, and the entire area is constructed like the late 1800's. If you are an old western fan, it's a must see location. It's located about 30 minutes outside of present day Tucson. Don't forget to stop by the large western apparel shop on the main drive in Tucson. Tombstone, Arizona Another Must See for Old Western Fans! If your in Southern Arizona, you would be foolish not to visit Tombstone, "The Town Too Rough To Die." This is the original town, almost as it was in the 1870's, not a recreation. You can see where Virgil Erp, brother of Wyatt Erp, was shot, the actual OK Corral and where the gun-fight occurred, and actors will reenact the fight and other famous bouts of the West, two or three times a day at the town theater, just as they occurred. As you walk through town, you can see or encounter late 1800's like gunmen walking around with actual six-guns on their hips. At the coroner photography store, you can have your photo taken in 1870's gun-fighter regalia too. There are of course many western apparel shops, but there are also gun shops which sell replica rifles and pistols of the era. Don't let "replica" fool you, for these are no toys, they are actual functioning fire arms. You can also purchase Sheriff and Ranger badges, books on Western history and cowboys of the old west and other matters. If your a fan of old western movies, don't miss this town! Dodge City, Kansas Here's Another for Old Western Fans and History Lovers Alike! If you want to see more of the old west, Dodge City, Kansas is also very good. Once a stopping point for the famous cattle drives, this town still has on display the tools of the cowboys, and some of the actual saloons where they once drank. If you really want to know what being a cowboy was all about, than you should try to visit historical sites such as these also. Training Ranch for reining. They can speak Japanese. For cowboys, Vegas means the big finals, the National Finals Rodeo which is held here every December. During the 10 day duration of the event, thousands of western shops gather to display and sale their merchandise at the convention. Just seeing this is enough to overwhelm you. On top of rodeo and shops, big name country artists conduct concerts at many of the hotels there also. Between the Strip and the airport, along with the Wallmart Mall is Shepler's Western Ware. Shepler's is a very famous mail-order company, and has many large outlets across the US. This Shepler's is especially big. Of course, the selection of merchandise is outstanding. You can get everything you could want to dress in modern cowboy fashion. However, it is a ways from the center of town, and you will need to go by car or taxi. If you take a cab, it may be hard to catch one coming back, so use caution when planning your visit. Golden Gate Western Wear may be the only western ware store in the San Francisco city area. The merchandise is mostly replicas of the old west era, which makes it unique even by American standards. It is great for those fans of old westerns, but may pose a problem for those of you who like the modern western style. Shirts and boots are all of that era. They carry numerous hats, and even have Calvary uniforms, guns and gun-belts. The owner has a wealth of knowledge concerning old westerns, and will answer any questions you may have. They also do custom made hats, and also have a hand in making hats for today's western themed movies. Go two blocks from the Fisherman's Warf's famous Crab with the ocean to your back to get there. OPEN: TUE - SAT 9:30 a.m. - 5:30 p.m., SUN 10:00 a.m. - 4:30 p.m. This store is located on the outskirts of L.A., and is not really a place for modern western ware, but more a supermarket of farm equipment for local ranches. And yet, they do carry a decent selection of hats, boots, jeans (in assorted colors), shirts belts and even a few buckles. Obviously they also have a good selection of saddles, bits, spurs and equestrian medical supplies, and not just western style equestrian equipment but also British. Take Fwy 10 East, and get off at the Fraizer St. Exit just past Fwy 605, take a left on Dalewood, and it is on your right. Best western shop in Hawaii. Largest ranch in USA as private property. You can ride a horse there. They have a western shop as Parker Ranch Store. If you like rodeo, one place you must try to visit at least once is Calgary, the Cowboy City. The Calgary Stampede, a large scale rodeo and festival held every July, energized the entire city. During the duration of the festivities, the town is overwhelmed with cowboys. We have been given a report concerning Calgary and their festival from Mr. Myoko, who resides in the Canadian city, and we are pleased to feature it below. Please take some time to visit Mr. Myoko's homepage, Myoko's Photo Stock Gallery and view his spectacular shots of the rodeo. If your looking for western ware, LAMMLLE'S is the largest establishment here. They are a franchise, and have 11 stores in Calgary alone. They not only carry the usual hats, boots and coats, but also equestrian equipment as well, and I never tire of visiting their stores. The Crowfoot Mall in the North West district is only about 30 minutes from the Calgary airport, and after shopping at Lammlle's, you can head on into Montana's for a good western meal. After a belly full, you can even head to Chapters and find numerous books and magazines about cowboys and even photo collections of past Calgary Stampedes. Unfortunately, in order to enjoy a scenic horse ride, you need to go to the outskirts of Calgary. You could rent a car and go to Black Diamond or Millarville, but it would probably be easier just to go to Banff. Go West on I-80 (a.k.a. Trans Canada) for about an hour and 20 minutes and you will reach Banff. It a single stretch of road, so it is a very simple drive. There is the Warner Guiding & Outfitting Ltd. or Adventures Unlimited there also. It would be quite unfortunate to come all the way to Calgary, and not enjoy a taste of Alberta Beef. Smuggler's Inn along Macleod Trail serves up a one-of-a-kind prime rib. If in Banff, Bumper's Beef House is also quite good (Although, I am of mixed feelings about them starting to carry menus in Japanese recently). They are crowded most of the time, so it would be best to go early or make a reservation. There is also another establishment called Buzzard's Cowboy Cuisine. 140 - 10 Ave. S.W. We're breeding Paint, Apaloosa, Quater Horses. We're coaching western style riding, espacially reining and western pleasure. We can give you information of Australia about cowboy stuff. There are some agencies in the US that will arrange horseback riding and cowboy vacations for Japanese. The information featured here is merely as an example, and REAL WESTERN guarantees nothing concerning it. Please be aware that we will assume no responsibility for any inconveniences you may encounter from utilizing any of the agencies featured on this site. Tour company which handles horseback riding, fishing and other outdoor sports tours in Montana and Wyoming near Yellowstone National Park. They will work with you to arrange a tour that best fits your wishes, and include opportunities to view rodeo, participate in cattle drives, ride horses and fish or any other cowboy dream you may have! As stated above, they will work with you to arrange a tour to fit your wishes other than the tours listed on their web page. They will also provide you with the latest information about the area before you go via Email also. A very pleasant plus. 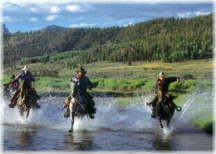 Tour company which handles horseback tours in the American Rockies. Horseback Tours in Montana and Wyoming. Horseback Tours in Australia, Canada, Vienna and other locations. Helicompter Tour company having many kinds of tours around Las Vegas, Grand Canyon and Hawaii. Fairview College offers special program for Japanses. Learning English and riding program(Japanese) says you can learn good pronunciation English and horseback riding in western style for 6 weeks in Canada. Copyright © 1999-2003 Real Western All Rights Reserved.